Limestone rock around the coast of Malta have been weathered into caves and strange rock formations. The rocks andcaves such as the Blue Grotto are quite a curiosity. Unfortunately, the high level of calcium carbonate means that it's best to drink bottled water in Malta. 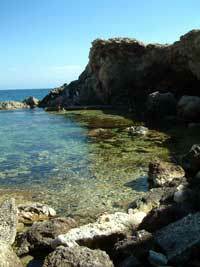 Slabs or beds of flattish limestone rocks can be viewed by the sea almost everywhere in Malta. They are actually quite comfortable for sunbathing and mean that you don't get sand in your food or sticking to your skin. The various rock pools and caves offer places to explore - children love them. The only thing to bear in mind is that there could be sea urchins with their sharp spines lurking at the bottom of rock pools, so best to wear protective shoes in the water. If you drive along the coastal roads you will discover numerous quiet and unspolied coves and rocky beaches. Perfect for family fun. Hire a car or use the local yellow buses. Limestone has protected the inhabitants of Malta through the centuries of war and persecution. Tunnels were dug by hand in the rock by families to create shelters from the horrendous pounding Malta suffered in the blitz of World War II. The resulting caves where people lived in the rock and tunnels can be seen to this day.